Most pilots learn to interpret light gun signals during their student pilot days. Yet, when I conduct flight reviews, or help students pursue an advanced certificate or rating, they often confide that they hope that they’ll never have a radio failure and be forced to interpret light gun signals from a control tower. Most pilots claim that they forgot about light gun signals at the conclusion of their student pilot days! Just another self-deprecating remark? Perhaps, especially since most of them end up able to fumble through the meanings of most of the signals as they think them over. Apparently, many of us pilot types only think about the meaning of light gun signals when some flight instructor asks about them! Perhaps more interesting though is that, although we know the light gun signal meanings, we don’t have much insight into situations that would result in receiving one light gun signal over another. For example, why would you get a “Flashing Red” signal? Before we go there, let us spend a moment back on the basics of what to do if we actually find ourselves unable to communicate with a tower? For the sake of review, here’s a chart that you can click to open a printable PDF version from the AOPA Air Safety Foundation. These signals also can be found in the 2010 Aeronautical Information Manual (AIM) as Table 4-3-1 and are discussed in the 2010 AIM at 4-3-13. This quest began because I was curious to know if the FAA provided any guidance for controllers to assist them in knowing when to use each of the various light gun signals. As it turns out, the FAA has not published any scenario based situations for controllers to reference for any of the signals other than alternating red and green signal. Alternating Red & Green – Use Caution! The alternating red and green signal is issued as a general warning to advise pilots to exercise caution. Here is the written guidance the FAA has provided for controllers in using it. “a. Aircraft are converging and a collision hazard exists. “b. Mechanical trouble exists of which the pilot might not be aware. I was struck by the fact that no other guidance is given for when to use the light gun signals. So, I did the natural thing: I asked controllers. I spoke to pilot friends who also had earned their degrees in air traffic control. In the end, I have concluded that the lack of specificity in guidance for using the other signals is likely due to the variable nature of the situations possible. The “variable nature of the situations possible”???? Steady Green & Flashing Green – Which is the one you want? If you are airborne, a steady green light is clearance to land. It’s quite straight forward, indeed. It advises that upon your arrival, the runway will be unoccupied and you have their permission to land on it. However, of more confusion is the “flashing green” signal – it means: “return for landing, to be followed by steady green at the proper time”. Wow! What would provoke a controller to do that to you? Imagine this: You’ve had a radio failure, you show up at an airport and receive the coveted steady green light, and yet, you’re too fast on final to safely land. You’d choose to go around (I hope)! The tower controller will observe you initiate the go around and could flash the green light to let you know you’re permitted to remain in the pattern and come around again if it appeared that the pilot seemed uncertain. The controller may even continue the flashing green signal while the aircraft is on the downwind leg until it turns base and it is obvious that the airplane is returning. The controller would then begin to use the steady green light signal to advise you that you are again “cleared to land”. 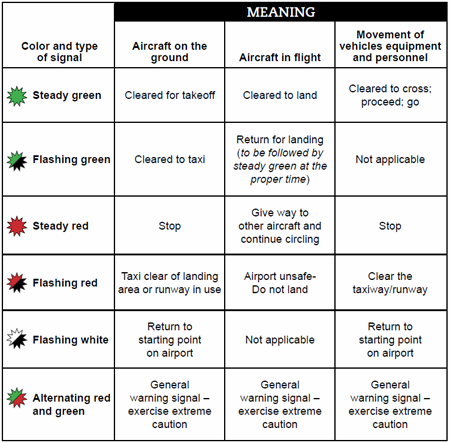 Alternatively, it is completely possible for the controller to also just continue using the steady green to indicate to the pilot that he or she is still, “cleared to land”! See that, the controller will use their judgment! Steady Red & Flashing Red – You don't really have to leave! In flight, a flashing red signal means that the airport is unsafe. You are not cleared to land! One person theorized that it could be used to indicate some sort of problem on or with the runway. This “problem” could be a vehicle, animal or debris. Of course as the pilot in command, you could choose to land anyway if you determined that the situation was so dire that it made more sense to land anyway. On the other hand, you, the pilot, may agree with the controller and choose to go around. You may decide to return for landing on the same runway. You may choose to go to another airport if the situation seems bad enough. It will be your decision what to do next as pilot in command. A steady red light gun signal means “Give way to other aircraft and continue circling”. It indicates the involvement of another aircraft and the controller wants you to allow it to precede you to the runway. Now, why this would be desirable is hard to imagine too. After all, an aircraft without a radio is treated as an emergency, and it’s not like the controller is going to try to allow someone to get another touch and go in before you arrive. But, it’s likely that the FAA has included this signal for the sake of allowing a controller to communicate any possible situation, if in their judgment, it is necessary. At any rate, the signal exists, and if you receive a steady read signal, you should expect to follow another aircraft to the runway. At that point, it becomes the pilot’s responsibility to determine how to most safely continue to the runway. You could extend the downwind leg to fall in behind the other aircraft. You could choose to reduce speed and fly a normal pattern. You may even choose to line up with and attempt to land on another runway at that same airport. Remember, it is your, the pilot in command’s, responsibility to always conduct the flight safely! How you accomplish that is likely to be as situational as the light gun signal you receive. 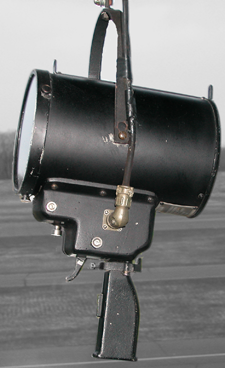 ATC light gun signals are instructions issues by a controller, and pilots are required to comply with them. As with any ATC instruction, never compromise the safe or legal operation of the flight for the sake of complying with a light gun signal. Pilots should respond to light gun signals to acknowledge them, just like any other instruction. The AIM recommends that airplanes move their ailerons and rudders to acknowledge light gun signals. In flight, this will result in a rocking of the airplane’s wings. On the ground, the signal will still be visible to the controller since he or she will see the control surfaces move! If you’re responding to light gun signals at night, flash your landing light in reply. The meaning of the light gun signals to aircraft on the ground is far less ambiguous. Just face the tower with the aircraft and await the instructions. If you have an in-flight radio failure, enter the airspace and the traffic pattern carefully, determine the flow of traffic and fit into it while watching for light gun signals. Remember, you do not need permission from the tower via light gun signal to descend into the airspace or the pattern! Aircraft experiencing a radio failure have literally circled above the vertical limits of towered airspace awaiting a light gun signal. This is not proper, or necessary!